Wayne County, OH, authorities are searching for a man accused of shooting at several officers during a police chase early Tuesday. 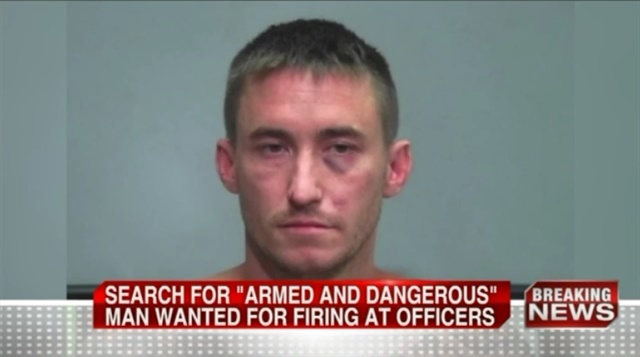 None of the officers were injured, reports WJW. According to the Wayne County Sheriff's Office, the suspect is James "Bubba" Schmidt. According to a press release, around 1:30 a.m. Wooster, OH, police received information that Schmidt was seen at a Walmart on Burbank Road. They went to the area in an attempt to apprehend Schmidt, whom they'd been searching for for the past several weeks. When Schmidt saw officers, he reportedly got into a vehicle with a female inside and led officers on a high-speed pursuit through Wayne County. At one point during the pursuit, he fired at officers, striking several police cruisers, according to the release. Schmidt is accused of later stealing an SUV out of an unattached garage and fleeing in it. He is described as being armed and dangerous.